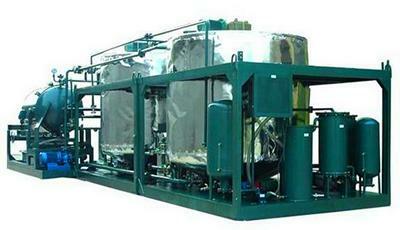 LYR System can effectively proceed the oil purification and decoloring works for various oils. LYR Series Multi-functional Decoloration Machine utilizes the physical treatment, on the premise of without affecting the components and the performance of the oil,to rapidly remove the color, moisture, impurities (particulate impurities and mechanical impurities) and gases(acetylene, hydrogen, methane etc) and other harmful ingredients, etc. in the lubricating oil,thus improving the quality of the oil and recovering oil’s viscosity, flash point and properties to make the oil purified and regenerated; and can effectively ensure the normal operation of equipment; meanwhile improve the life cycle and avoid accidents. Oils to be treated: Transformer insulating oil, lubricating oil, hydralic oil, machinery oil, coolant oil, cooking oil, coconut oil, base oil, diesel fuel oil in oil field, and other oils used in mine, metallurgy, electricity, transportation, manufacturing, food industry, etc... but synthetic type engine oil and car oils are excluded. This system can also be equipped with waste oil distillation plant to highly improve the dark oil color and quality after distillation process. This machine adopts the the latest micro-filtration technology,which is a multi-functional purification system with vacuum oil filter, fine filter and decolorizing device. It uses pure physical treatment to remove water, gases, impurities and decolor,which will not affect the composition and performance of the oil. Equipped with chain protection system, the machine is easy to operate, safe and reliable.